Moving can be an occasion you remember forever. Make sure it’s for the right reasons. In this article, we disclose some simple tips that ensure as much efficiency as possible; enabling you to get on with the important job of settling into your new home. There’s nothing worse than trying to pack a whole household into cardboard boxes in a couple of days. Equally, it’s horrible to pack too early and spend the last couple of days before you move with no fresh clothes, toothbrushes or razors. You’d be surprised at what people pack away without even thinking about it. The best way to do it is to start packing two weeks before you move. Work out what you need for the next two weeks and pack non-essentials in easily stackable cardboard boxes. Put these boxes in the garage if it gives you more space. · Books - Keep one beside your bed if you are a reader – anticipate how long reading the book is likely to take. Leave two out if necessary. · Makeup – Do you apply a full face of makeup or are you reliant on one eyeliner stick and a lipstick? Keep ONLY the essentials by your mirror in the bathroom, pack the rest away. · Utensils and crockery - Do you live as part of a couple? If so only leave out two plates, cups, forks, knives and one each of your essential utensils. · Food – Do you have non-perishables, like tins of food that you won’t be consuming for the next two weeks? Pack these away as well. One really efficient way of packing cheaply and efficiently is to buy a house moving pack; a house moving pack will typically come with boxes, the right tape and other implements to aid you in your move. The materials are extra good because everything in the pack is designed specifically to facilitate a house move. · Hiring a van or cross country moving companies to move? 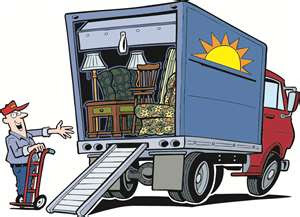 Sort this out a month before you intend to move, this gives you time to shop around and get the best combination of great service and cost-effectiveness. · Notify your utility providers – Do this a month before you move. Don’t be held responsible for council tax/energy bills accrued after your moving out date. · Practice your route to work/school/college: Moving slightly further away from work or school? Do the route a couple of times and calculate how long it takes you. Then add ten minutes to this total. This will be the amount of time you need to leave for work/school before you need to be there. Don’t get lost! Moving is stressful, but the majority of us are doing it to get something better than what we had before. You get far more out of moving than you lose if you are prepared. This guest blog has been brought to you by Wessex Packaging, a Salisbury-based packaging manufacturer. Find out more by going to http://www.wessex-packaging-salisbury.co.uk or by calling on 01722 412333.